Multiply your available outlets with this 4 Plex box. 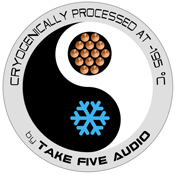 This high-grade 4 Plex uses all Deep Cryo Treated parts and is based on the Deep Cryo Treated Neotech NEP-3003 MK III. The NEP-3003 MK III is a 3/13 cable and is double shielded with Mylar foil shield and a dense braided tinned copper shield on top. We finished the termination with a Furutech FI-11M-N1(G) Gold plated wall plug. The new Neotech NEP-3003 MK III utlizes 13 AWG UP-OCC Copper / Silver plated UP-OCC Hybrid conductors for hot, neutral, and ground, as well as a twin shield of metalized Mylar and a dense tinned OFC copper braided shield. The overall outside diameter of the NEP-3003 cable is 11.4mm. We have terminated this 4Plex cable with the Deep cryo Treated Hubbell Hospital Grade HBL420HI/HBL4PBI outlet/box combination and Furutech Gold plated FI-11M-N1 wall plug. Terminations have been treated with DeoxIT Gold during assembly. The base price is for a two foot cable, the cable can be ordered in lengths up to 12 feet.